Check this out. 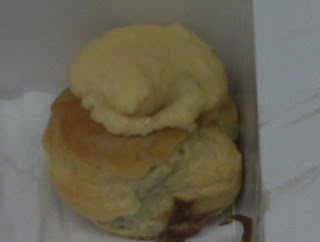 It's from Safeway (yes, the grocery store!!). It's a foccacia bread filled with sun dried tomato pesto, spinach, fresh mozzarella and fresh tomatoes. I think it's a bit pricey at $6.99 for a small sandwich (about 4" square) but I do get away with eating half and some chips or pretzels so it does stretch. 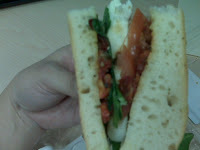 I haven't tried any other sandwiches because I absolutely love fresh mozzarella and the sun dried tomato pesto. I think there is something else as well, but I can't figure it out. Try it and let me know your thoughts! !